A leading manufacturer that designs and builds gerotors for use as pumping and motor elements contacted us to help in the development and deep draw stamping of parts. Our customer encountered a possible problem after the first production run. There were concerns about the surface roughness of the inner cylinder failing. We were able to find a solution and satisfy the production needs of this customer and continue to do so by delivering this part to specification – every time. We were able to find a solution because of the reliable trusting relationships that we have formed over the years – with customers and dedicated, expert staff members alike. So, what was the solution and how did it come about? 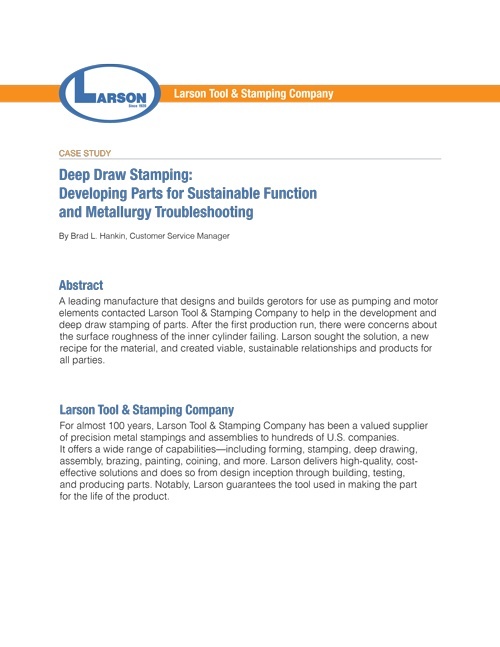 Read the full story in our downloadable case study, “Deep Draw Stamping: Developing Parts for Sustainable Function and Metallurgy Troubleshooting.” Download it now.